Cartier and America the exclusive exhibit will debut at the Legion of Honor in San Francisco on December 17th, 2009, to celebrate the 100th anniversary of Cartier in the United States. The exhibit will feature several famous and important works by Cartier, one of which is my favorite necklace from the Tutti Fruitti collection. 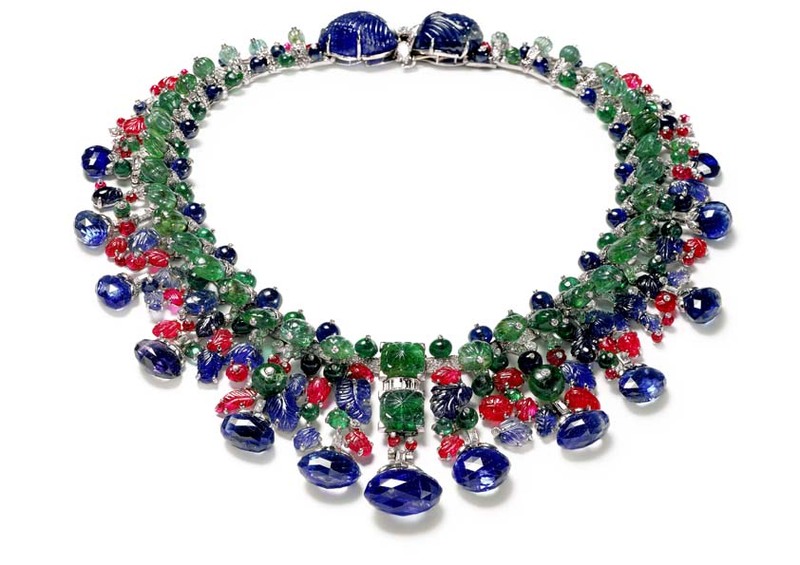 Nicknamed “Tutti Fruitti” by Cartier in the 1970’s because of its resemblance to an Indian fruit salad, the famous colorful Mogul style inspired necklace was commissioned from the House of Cartier by Daisy Fellowes in 1936. Marguerite Severine Philippine, known as Daisy, was born in Paris in 1890 into a world of wealth and nobility. Her mother was Isabelle Blance Singer, daughter to the sewing machine inventor Isaac Singer, and her father was the fourth Duc Decazes et de Glucksbierg. In the 1920’s Daisy became one of the most elegant, glamorous and interesting woman in Europe. She was a pioneer in fashion, knowledgeable about art history and a great hostess all in one. American Vogue noted that she had an inborn taste for dress and graciousness. She also became known for her large and important jewelry collection which included several Carter pieces. During the 1930’s European interest in Indian culture became popular as traveling to India became easier. The wealthy tourists traveled throughout the country on the Darjeeling Express and bought ruby, emerald and sapphire beaded necklaces. Enamored with the bejeweled elephants of Jaipur, they returned to Paris with the gemstones as souvenirs of their trip. Cartier then transformed the colorful gems into fine jewelry. Trendsetters like Misia Sert, Daisy Fellowes, Ganna Walska, Mrs. Harrison Williams and the Duchess of Windsor all began wearing Indian style jewels created by Cartier to compliment their lavish Indian theme parties Elsie de Wolfe imported real elephants to her villa in Versailles for one of the soirres. The Oriental tutti-fruitti jewelry began in 1901 when Pierre Cartier was asked to create an Indian necklace for Queen Alexandra, wife of Edward VII, for the celebration of India becoming a part of England’s Empire. The Queen was in need of matching jewelry to be worn with her Indian gowns sent to her by Lady Curzon from India. Jacques Cartier traveled to India in 1911 for the coronation of Georges V at the Delhi Durbar where he met and became friends with India’s Maharajahs. As Jacques was interested in purchasing the beautiful gems from India the Indian princes were asking Cartier to redesign their existing jewels into a European style, which resulted in many years of patronage and friendship. The traditional Indian enameled jewelry and engraved gemstones inspired the designers of Cartier’s Art Deco jewelry which translated into the usage of black enameled paired with pink corals. When Jean Toussaint joined the House of Cartier in 1910, she understood the importance of how a woman of fashion should wear this bold colorful style of jewelry. An elegant young woman Jean Toussaint wore Indian gemstone jewelry years before it became in vogue. She worked with Charles Jacqueau in Paris and Georges Genaille in New York in the creative department of Cartier during the 1920’s and 1930’s in the designing of the Indian Hindu Collection. Most of the collection was set in platinum in a very feathery light style so the stones seem to be in a collection with out any metal at all, which truly resembled a bowl of exotic fruit. Cartier also used a bold yellow gold with the colorful gems and Cartier brought this new style into fashion almost overnight. Vogue proclaimed in 1933 that the “Indian Jewels started a new gold rush.” Cartier exhibited in the Exposition in 1931 Indian emerald bead tiara and won a prize. Daisy Fellowes tutti fruitti necklace went through many transformations over the years. Originally purchased in June 1928 as a string of emerald and sapphire beads with a fringe of thirteen oval sapphire briolettes capped by foliate platinum mounts set with diamonds and baguette diamond stems with the tassel cord as a fastener. The next year Daisy purchased a bracelet with carved emerald buds with carved ruby leaves and two larger sapphires carved as bud motifs. Again in 1936 she decided to combine both the necklace and the bracelet with another bracelet (which was not identified). Daisy commissioned Cartier to transform the original necklace and two bracelets into one new necklace. Lavabre, the work master for Cartier, transformed the combination including 250 extra gemstones supplied by Cartier into an exciting and sensational ‘Collier Hindou’ (Hindu Collar). Made in platinum and white gold set with several marquise baguette and round diamonds, thirteen briolette blue sapphires which weigh146.9 carats in total, two leaf shaped curved sapphires weigh 50.80 and 42.45 carats respectively, a strand of sapphire beads, one cabochon sapphire, strand of cabochon emeralds, leaf shaped carved rubies, smooth and carved ruby beads and cabochon rubies. Photographs by Cecil Beaton of Daisy wearing the necklace were published in January 1937 issue of Vogue. In 1951 Daisy wore her incredible Tutti Fruitti Hindu Collar to the famous Beistegui masked ball in Venice. The photographs of her in costume wearing the large colorful Hindu Collar became legendary. The final version of the famous Daisy Fellowes Tutti Fruitti necklace as we know it today was completed in 1963. Daisy commissioned Cartier to redesign it for her daughter, the Comtesse de Casteja, as a wedding necklace. The silk cords were removed and the two large carved sapphire buds were used for the clasp. The center which was originally designed as a clip became a fixed smaller ‘center piece’ by placing the two square carved emeralds in a linear form rather than side by side. Some of the carved ruby and emerald leaf motifs were removed to the sides of the necklace from the front. The finished necklace is now known as “Tutti Fruitti” and not the Hindu Collar. Daisy Fellowes was a true connoisseur of fine gems and patron of Cartier. She enabled jewelry to be created during a time of economic depression which is art history for us to appreciate today.